The tissue response to porous implants can dictate the long-term success of these implants. Imaging techniques are important to not only determine the response and cause of the clinical outcome, but also provide data that is predictive of the clinical outcome. In general this is an important biomaterials/tissue engineering concern that relates to failures and/or clinical problems (e.g. problems with asbestos and meshes used for hernias or bladder and uterus support). Earlier work showed the importance of implant configuration on the implant's effectiveness as a tissue scaffold for skin wounds [1,2] as well as other soft tissue defects [3-5]. Optimization of implant configuration leads to significant enhancement of regenerative skin healing [1,2]. Variables such as pore size; percent porosity, fiber diameter, and surface roughness of the matrix determine the speed and completion of ingrowth [6-14]. Clinical success, particularly for hermia meshes can also be related to the mechanical properties including strength and stiffness [15-17]. A number of investigators have looked specifically at optimizing porosity (pore size, pore shape, and percent porosity) for tissue ingrowth [4,6,11]. In tissue engineering applications, this optimization has also been for degradation rate, cell seeding, or cell viability [1,2,11]. For example although pore size must be large enough to allow blood vessel ingrowth (at least 40 μm) , at large pore sizes the scaffolding effect appears to decrease. The optimal pore size suggested for collagen based artificial skin is approximately 100 μm [1,2]; with hernia meshes about 75 μm . Examples of porous implant devices that have failed due to inadequate tissue ingrowth or the inability to limit the chronic inflammatory response include breast implants covered with porous polyurethane. The failure of these porous polyurethane coatings, due to the excessive inflammatory response, was a major reason that silicone gel implants were examined more closely and eventually removed from the market . More recently porous devices used to support the uterus have eroded through the vaginal wall; most likely due to the inflammatory response . Hernia meshes can also fail due to inadequate mechanical properties, but this failure can typically be linked to the inflammatory response [15-17,19-22]. For fibrous implants, the fiber spacing has been used as the pore size. It has been shown that the average fiber spacing requirements are similar to the pore size requirements (40 μm) for vascular ingrowth . In fabric implants, however, the fibers can elicit an inflammatory response leading to giant cells and macrophages surrounding the fibers . This serves to reduce the effective fiber spacing for tissue ingrowth leading to pore size requirements that can be over 100 μm [6,8]. With less tissue ingrowth there is normally increased fibrous encapsulation thickness [12,14]. Increased inflammation is also accompanied by increased cytokines and enzymatic production, which can adversely affect the tissue ingrowth . Further, in many cases, tissue ingrowth does not occur until the inflammatory response is resolved . The inflammatory response has also been linked to the size of foreign materials in other cases. For example, the length to diameter ratio of asbestos fibers is thought to be important in controlling the inflammatory response [7,18,23]. Similarly in gout the monosodium urate (MSU) needle crystals must reach a certain size before an inflammatory reaction, leading to joint pain and swelling, occurs [7,23]. This phenomenon is similar to the relationship of the size of particulate formed after joint replacement as well as silicone gel leaching from breast implants (and forming droplets) and the resultant inflammatory response [7-10]. In each case it has been suggested that above 50 μm diameter particles (or droplets) behave like bulk materials [7,18,23,24]. There is also evidence that the response dies down below about 5 um [13,23]. At this size, particles see more of a macrophage than a giant cell response  and single fibers can have little to no fibrous encapsulation . Many current fiber implants, however, particularly polyethylene terephthalate (dacron velour and meshes) are in the range that elicits the greatest response . There is, however, the debate over the importance of configuration versus chemistry in determining response to these foreign materials. There is variability in response to particles of different materials with some particles like MSU eliciting a more severe response than other particles of the same size . The most severe responses are to surfaces that breakdown in vivo particularly inside phagocytic cells [7,18,23]. It has been suggested that the more stable the surface chemistry of the foreign material the more important the configuration becomes [1,6]. It has been shown that if the fibers or particles are stable then both the inflammatory response and angiogenic response are relatively similar independent of material or surface charge [7,8,12,13]. Although the effect of altering the configuration of non-fabric implants has been investigated; there are limited studies for fabric implants. This is partly due to the difficulty in controlling both fiber diameter and fiber spacing (or porosity). The goal of this study was to examine the relationship of the inflammatory response to the configuration of a fabric implant. It was expected that the best fiber spacing should depend on the fiber diameter and its resultant giant cell response. It was hypothesized that fiber diameters above 50 μm would yield the best result as long as the fiber spacing was above 40 μm. At fiber diameters below 50 μm, the spacing between fibers requirement would increase related to the reduction in effective pore size caused by the inflammatory response; to have the same space for tissue ingrowth. Although there is some fibrotic response to all synthetic materials, it is the giant cell response that leads to a significant reduction in effective pore size . Also for fabrics the entire fabric, versus the individual fibers, gets encapsulated . As long as the material is stable (not releasing small molecules or cytokines) it is the fiber diameter that will determine the response . Surface treatments and coatings can have an effect, but it is usually not significant or long-term unless there are substances being released [7,15,18]. In blood compatibility differences in the initial protein interactions can have a dramatic effect on the long-term response; however, in soft tissue the surface of the material will look similar within a few days independent of the material (as long as the size and shape are the same, the material is stable, and the environment is similar) [6,18,25]. A better understanding of the relationship between fiber diameter and average distance between fibers could be used to better design fabric implants to reduce the inflammatory response to provide better tissue ingrowth. One important example is the design of percutaneous devices. In this case, the implant penetrates the skin in order to provide external access into the body as for long-term catheters or tubing for dialysis. Typically, fabric materials have been used to create a bacterial seal at the skin line and prevent failure of these implants. The failure occurs due to the epidermis continuing to grow along the surface of the implant, creating a sinus tract, which predisposes the implant to infection and ultimate failure . Prevention of this epidermal down growth by tissue ingrowth has been the route taken by most investigators . Fabric materials are the materials of choice because they allow rapid connective tissue ingrowth . Since epidermal basal cells do not migrate through intact tissue or collagen layers, “good” ingrowth should stop sinus tract formation and marsupialization . Using a polyethylene terephthalate fabric, with 25-40 μm in diameter fibers, elicits an inflammatory response severe enough to prevent maturation of the tissue to a level to stop sinus tract formation . Determining a better design of these fabrics could help prevent sinus tract formation and increase the longevity of these devices. The fabrics used in this study were made of non-medical grade monofilament polyethylene terephthalate (PET) fibers in a plain square weave (Tetko, Inc. Briarcliff Manor, NY). In this type of weave, the fibers were perpendicular to each other and were put over and under each other in a simple repeating pattern resulting in square pores, or fiber spaces. The configurations tested in this study, with those values provided by the company, are shown in Figure 1. Figure 1: The fiber spacing and fiber diameters provided by the company. Based on information provided by the company, these fabrics had one of three anti-static coatings. These thin coatings were chemically bound to the surface of the fabrics to facilitate better handling properties. The coatings were stated to be polymer derivatives of polyeoxethylene polyalkylene polyamine. The fabrics could therefore be divided into three groups based on coating type. Group 1 consists of the five fabrics (112/33, 120/50, 158/48, 160/38, and 200/44); group 2 consisted of three fabrics (105/18, 131/27, and 180/31); and group 3 consisted of one fabric (88/34). In order to better characterize the anti-static coatings and verify the groupings, samples of each fabric, which were prepared as if they were to be implanted, were examined using Fourier Transform Infrared Spectroscopy (FTIR). The spectra were collected from one or two layers of each fabric in an atmosphere of nitrogen using a Nicolet 10P system with a spectra-tech collector diffuse reflectance accessory. Powder potassium bromide was used to collect a background spectrum. A piece of uncoated, non-medical grade PET fabric (Testfabrics, Inc., Middlesex, NJ) was used as a control. In order to determine if the coatings were breaking down or any substances were leaching from the fabrics, samples of each coating group were extracted in distilled water, ethanol, or acetone for 8 to 9 hours following the normal cleaning procedure using a 250 ml Soxhlet extraction system. This liquid extract was examined using FTIR. For implantation, one-by-two centimeter pieces of fabric were cut from each sample. The same nine fabric samples were used throughout the study. These pieces were cleaned in order to degrease the material and prepare it for the sterilization process using an ultrasonic cleaner and hot soapy water. During this procedure, the materials were only touched by clean forceps. The implants were sterilized using ethylene oxide at the University of Alabama at Birmingham Hospital using standard methods and were allowed to aerate for at least 24 hours before they were implanted. Anesthetized New Zealand White rabbits, using Ketamine/Ace Promazine (Aveco, Fort Dodge, IA), were shaved and scrubbed using Betadine surgical Scrub (Purdue Fredric Co., Norwalk, CT) in preparation for surgery. Using aseptic technique, one or two incisions were made on each side of dorsum approximately one inch lateral to the spine. Three separate pockets were made by blunt dissection in the subcutaneous layer, just beneath the cutaneous trunci muscle, of each incision. One implant was placed in each pocket. The position of each implant type, in the rabbit, was randomized throughout the study. Six rabbits were used in the two-week study with each having one of each of the nine fabrics. Two rabbits were used in the four-week study and received twelve fabrics each, two each of six selected configurations (88/34, 105/18, 120/50, 131/27, 158/48, and 160/38). The subcutaneous layer was closed with a coated Vicryl suture (Ethicon, Somervile, NJ) using a simple continuous stitch. Throughout the implantation period, the rabbits were checked daily to verify health and to examine the incision sites. The study protocol was in compliance with the University of Alabama at Birmingham’s guidelines as outlined in “Guide for the Care and use of Laboratory Animals” prepared by the Institute of Laboratory Animal Resources and published by the National Institutes of Health (NIH Publication No. 86-23, Revised 1985). At the predetermined time, two or four weeks post-operatively, the rabbits were sacrificed with an overdose of pentobarbital. Each implant and the surrounding skin were removed and placed in a 10% formalin solution, Pen fix (Richard-Allen, Richland, MI). After fixation, the samples were cut into two pieces, to allow histology to be done from the middle of the implant. The tissue specimens were embedded in paraffin and sectioned at five microns thick. The tissue was stained using hematoxylin and eosin or Gomori’s trichrome. Imaging was used to verify the fabric configuration (fiber diameter and distance between fibers) as well as the tissue response. In order to quantify the tissue response, histomorphometric measurements were made in either the pore areas between the fibers or the capsule areas surrounding the implant. Measurements included volume percents of cells (PMNs, fibroblasts, and macrophages), blood vessels, and collagen; and blood vessel average diameter. In the capsule, the capsule thickness was also estimated as the width of the more fibrous, dense portion surrounding the implant. For the pore area the percent of fibers surrounded by giant cells was also measured. The volume fractions of cells were obtained stereologically, by superimposing a grid over the entire histological section and determining the fraction of the grid points on the feature of interest (cell nuclei or collagen). This point count fraction approximates the area fraction, which approximates the volume fraction. All blood vessels were outlined and the area fraction was determined for each field. Similarly, this area fraction approximates the volume fraction. The average blood vessel diameter was calculated from the cross-sectional area by assuming a circular cross section. The capsule thickness was found by dividing the capsule area by its length. For measurements in the pore areas, the area of the fibers was subtracted out of the field areas to normalize with respect to fiber spacing. For the giant cell measure, the number of fibers surrounded by giant cells was divided by the total number of fibers in the field. This approximates the surface area fraction of fibers covered by giant cells in 3-D.
Statistics were done on the measurements using the SAS statistics software program (SAS Institute, Inc., Cary, NC). The GLM (General Linear Model) procedure and the Least Square Means procedure were used to determine differences among fabric configurations at each time period as well as to rank order them. For comparisons between the same configuration at each of the two time periods as well as for comparing expected and actual fiber diameter and spacing, a two-tailed t-test was used. For all data, a p value <0.05 was used to prove significance. The RSREG procedure, which performs a response surface design type of analysis, was also used. This method fit parameters to a complete quadratic surface and then determined the critical values of this surface, which optimized the response based on the factors in the model. The factors used in this analysis were the fiber spacing and fiber diameter. The model provides the probability that the model fits the data and the importance of each parameter in determining the response variable. The CORR procedure was used to obtain correlation coefficients between variables, including the Pearson Product-moment correlation. This was used to determine if any significant correlations existed between any two measurements at either time period or overall. In order to make comparisons with as little bias as possible, a quantitative method was used to summarize the tissue response to these fabrics. Histomorphometry is based on derivations to allow 2-D measures to approximate 3-D measures. Some error in this method is expected due to the shape of the cells and blood vessels as well as the thickness of the sections. Since the values were used for a comparative type of analysis and the anticipated error is very small, it is expected that these errors did not confound the results. Although it would have been better for all the fabrics to have the same surface chemistry; based on previous studies the different coatings should not have a significant impact as long as the surfaces were stable. Therefore, it was important to remove leachables from the fabrics prior to implantation using a soxhlet extraction procedure as well as compare the surfaces chemistries and leachable substances. The actual measured values of fiber spacing, fiber diameter are reported in Figure 2. Except for the fiber spacing for the 200/44 fabric and the fiber diameter for the 120/50 fabric, all measured values of fiber spacing and fiber diameter were significantly different from their corresponding expected values. 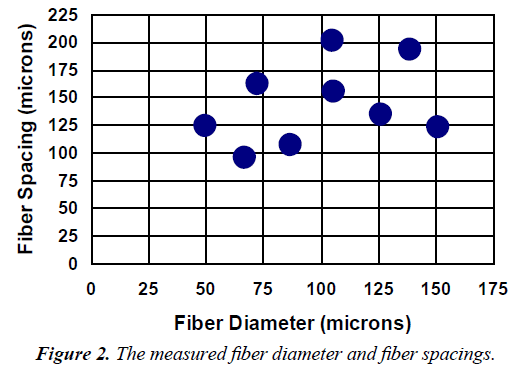 Figure 2: The measured fiber diameter and fiber spacings. 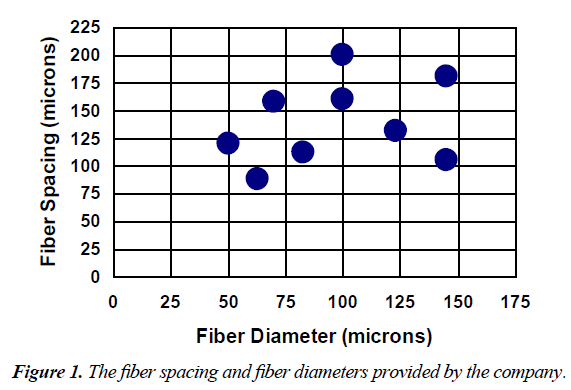 In the results section, the Figure 1 fiber spacing and fiber diameter was used, however, in Table 1 and 2 as well as the discussion the Figure 2 fiber spacing and fiber diameter was used. Table 1. The 2-week histological results from the pore area. Table 2. The 2-week histological results from the capsule area. FTIR analysis of the samples revealed that the 6 fabrics with coatings in groups 1 and 3 had similar spectra. These spectra exhibited a band frequency shift from 3430 cm–1 to 3434 cm-1 as compared to the control. The other three samples, 105/18, 131/27, and 180/31, had spectra that were not different from the control fabric. No substances were detected, using FTIR, in the extraction fluids from the samples of fabrics in distilled water or ethanol. The extract from the acetone revealed a wax-like substance that was also found when no fabrics were used. Upon retrieval, some signs, including redness of the inner surface of the skin and the presence of blood clots, were seen in one implantation site in each of three rabbits; two rabbits from the two-week study and one rabbit from the four-week study. Because of the random nature of this phenomenon, the results from these 9 implants were not included in the statistical evaluation of the tissue responses. The samples excluded were 200/44 (2 samples), 180/31 (2 samples), 160/38, and 131/27 at two weeks and 158/48 (2 samples) and 120/50 at four weeks. Because of the FTIR study, the fabrics were placed into two groups: coatings 1 and 3 and coating 2. Pore area The histological results from the pore areas are shown in Table 1. A graph of macrophage volume fraction (Mv) versus fiber diameter is shown in Figure 3. 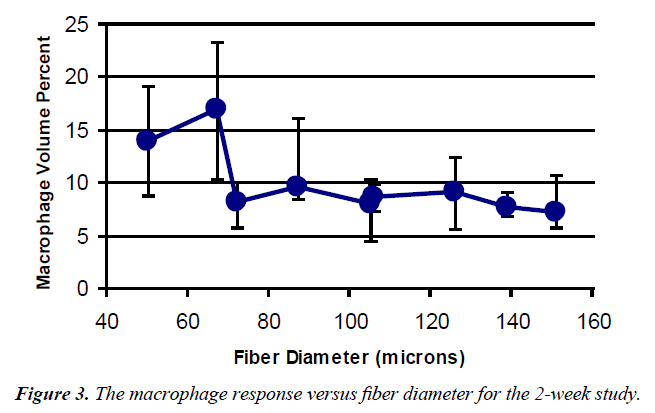 Figure 3: The macrophage response versus fiber diameter for the 2-week study. The values at the first two points (120/50 and 88/34) were significantly different from all the other measurements, but not from each other with mean values of 14 and 16%. None of the other values were statistically different from each other and represented approximately a 50% reduction in Mv. Using the nine fabrics a significant regression (Figure 4) was found for the macrophage response (p<0.001). Based on the response surface regression (RSREG), the highest Mv occurred at the smallest fiber spacing and fiber diameter, with fiber diameter having more of an influence than fiber spacing. The R2 value, which estimates the portion of the variation in the data that can be attributed to the model and not random error, was 0.44. This means that 44% of the variation in the Mv data can be explained by the predicted regression model. Figure 4: The response surface design for the 2-week macrophage response. The regression equation was Macro = 50.5+0.29(FS)- 0.31(FD)+0.0004(FS2)+0.0005(FD2)-0.001(FS)(FD). Analysis of the six coated fabrics also resulted in a significant regression for Mv. This regression also showed that the highest Mv occurred at the smallest fiber spacing and fiber diameter, with fiber diameter having over twice the influence of fiber spacing. The R2 for the regression was 0.47. For the fibroblast volume fraction (Fv) only the values for fabrics 120/50 and 131/27 were statistically different from each other with the 120/50 having about a 35% increase over the 131/77 fabric. No significant regression, however, could be obtained from these data. Values of blood vessel volume fraction (BVv) and polymorphonuclear leukocyte volume (PMNv) had no significant differences among the different fabric configurations. This was the case even though the BVv had over a ten-fold increase from the lowest to the highest value and for the PMNv four of the nine fabrics had no PMNs present. In addition, no significant regressions could be obtained for either of these measurements. For the volume fraction of collagen (Cv), the only statistically significant differences were between the 105/18 fabrics and both the 88/34 fabric and the 120/50 fabric, with the 105/18 fabric having about a 20% increase over the other two fabrics. No significant regression, however, could be obtained from these data. For the percent coverage by giant cells (GC), the 88/34 fabric had the highest value, statistically greater than all fabrics except the 158/48 fabric. The smallest response was seen with the 105/18 fabric, about 1/7 of the 88/34 fabric, which was significantly lower than all fabrics except the 131/27 and 180/31 fabrics. The RSREG showed the GC decreasing as fiber diameter and fiber spacing increased with fiber diameter having more influence than fiber spacing. The R2 value for this regression was 0.31. Figure 5 shows a giant cell around a fiber in a TEM micrograph, with giant cells forming sleeves around the fibers when the diameter is in the 25 μm range . Figure 5: An electron micrograph showing a giant cell around a polyester fiber (F). For the average blood vessel diameter (BVd) the largest values were for the 131/27, 88/34, and 180/31 fabrics, which were statistically greater (about twice the value) than the 120/50, 160/38, and 158/48 fabrics. The RSREG showed the BVd increasing with increasing fiber diameter and increasing fiber spacing, with the fiber spacing having slightly more influence than the fiber diameter. The largest values predicted, occur with both fiber spacing and fiber diameter over 100 μm. The smallest values occur with fiber diameters below 75 μm and intermediate fiber diameters close to 150 μm. The R2 value for this regression was 0.38. Capsule area: In the capsule area (Table 2), the Mv, Cv, PMNv had no statistically significant differences among the different fabric configurations and no significant regressions could be obtained for these measurements. This was the case even though five of the nine fabrics had no PMNs in the capsule region. For the Fv, the 180/31 and 112/33 fabrics had significantly lower values (about 25%) than the 88/34 and 160/38 fabrics. No significant regression, however, could be obtained from these data. For the BVv, the 200/44 fabric had a significantly higher value (about140%) than the 105/18, 131/27, and 158/48 fabrics. Also the 120/50 fabric was statistically higher (about 165%) than the 105/18 fabric. No significant regression, however, could be obtained from these data. For capsule thickness (CTH), the 120/50 had the smallest value, which was statistically smaller (about 60%) than the 105/18 and 200/44 fabrics. The 105/18 fabric had a CTH that was statistically larger (about 110%) than the 112/33, 160/38, and 180/31 fabrics. No significant regression, however, could be obtained from these data. For the average blood vessel diameter (BVd) the highest values were for the 200/44 and 120/50 fabric, which were statistically greater (about 75%) than the 105/18, 131/27, 88/34, and 158/48 fabrics. The 180/31 fabric had a statistically higher value (about 70%) than 105/18, 131/27, and 88/34. In addition, the 112/33 fabric had a statistically higher value (about 50 %) than the 105/18 fabric. The RSREG showed the BVd increasing with increasing fiber diameter and increasing fiber spacing, with the fiber spacing having more influence than fiber diameter. The lowest values were at high fiber diameter, near 150 μm, and small fiber spacings, close to 120 μm. The R2 value for this regression was 0.25. The four-week histomorphometric results are shown in Tables 3 (pores) and 4 (capsule), for the six selected fabrics. Table 3. The 4-week histological results from the pore area. Table 4. The 4-week histological results from the capsule area. Pore area For the Mv, in the pores, the 88/34 fabric had a significantly higher value (about 70%) than the 160/38 fabric. Although the trends were similar to the two-week data, a significant regression could not be obtained from these data. For the Fv, the 120/50 fabric had a significantly higher value (about 40%) than the 131/27 fabric. Similar to the two-week data, a significant regression could not be obtained from these data. For the BVv, similar to the two-week data, no statistically significant differences among the different fabric configurations were found and a significant regression could not be obtained for these data. For the Cv, the 131/27 fabric was significant higher (about 30%) than the 158/48 fabric. Similar to the two-week data, a significant regression could not be obtained from these data. For the PMNv, the 158/48 was significantly higher than all fabrics except the 120/50 fabric. Similar to the two-week data, no significant regression could be obtained from these data. For GC, the 158/48 fabric had a significantly higher value (about 200%) than both the 105/18 and 131/27 fabrics. The RSREG showed, similar to the two-week data, the GC decreasing as fiber diameter and fiber spacing increased with fiber diameter having more influence than fiber spacing. The minimum value for the regression was at 0.07 (about 1/6 of the 131/27 fabric value) at a fiber spacing of 123 μm and a fiber diameter of 108 μm. The R2 value for this regression was 0.57. For the BVd, unlike the two-week data, there were not significant differences among fabrics and a significant regression could not be obtained from these data. The largest diameters were, however, about 90% larger than the smallest diameters. For the Mv, in the capsule, although the highest value was over twice that of the lowest values no significant differences were seen among the different fabrics. The RSREG was significant for the four coated fabrics and showed the Mv decreasing as the fiber spacing and fiber diameter increased. The R2 for the regression was 0.76. For the Fv, the 120/50 and the 105/18 fabrics had a significantly higher value (about 40%) than the 131/27 fabric. Similar to the two-week data a significant regression could not be obtained from these data. For the BVv, the 160/38 fabric had a significantly higher value (about 90%) than the 88/34 fabric. Similar to the two-week data, a significant regression could not be obtained from these data. As for the two-week data, both the Cv and PMNv had no statistically significant differences among the different fabric configurations and no significant regressions could be obtained for these measurements. This was the case even though four of the six fabrics had no PMNs in the capsule region. For CTH, the 105/18 had the smallest value, which was statistically smaller (about 50%) than the 160/38 fabric. Similar to the two-week data, a significant regression could not be obtained from these data. For the BVd, the 160/38 had a significantly higher value (about 45%) than the 131/27 fabric. Unlike the two-week data, a significant regression could not be obtained from these data. Six fabrics could be examined in both time periods. From the volume percent measurements, only the BVv and the PMNv exhibited statistically significant differences in the pore area, between time periods. For the BVv, the 105/18, 158/48, and 160/38 fabrics had significantly higher values (three to fourteen fold increase) at four weeks compared to two weeks. For the PMNv, the 120/50 and 158/48 fabrics had a significantly higher value (about a 20 fold increase) at four weeks. For the GC the 88/34 fabric had a significantly higher value (about 90%) at two weeks. For the BVd, the 131/27 fabric had a significantly higher value (about 90%) at two weeks. In the capsule area, for the Mv, the 160/38 had a significantly higher value (about 190%) at two weeks. For the Fv, the 88/34 fabric had a significantly higher value (about 30%) at two weeks. For the BVv, both the 105/18 and the 160/38 fabrics had significantly higher values (about 150%) at four weeks. For the Cv, the 88/34 fabric had a significantly higher value (about 15%) at four weeks. For the CTH, the 105/18 fabric had a significantly higher value (about 195%) at two weeks. For the BVd, both the 105/18 and the 160/38 fabrics had significantly higher values (about 40%) at four weeks. In the pore area, at two weeks, the Mv and Cv exhibited a significant negative correlation (r =0.40). The BVd and BVv were positively correlated (r=0.61). At four weeks, Cv again demonstrated a significantly negative correlation to Mv (r=-0.61) and in addition showed negative correlations to GC (r=-0.67) and BVv(r=-0.57). The BVd and BVv again exhibited a significant positive correlation (r=0.86). For both time periods, Cv showed significant negative correlations to GC (r=-0.29), Mv (r=-0.44), and Fv (r=-0.29). The GC and Mv had a significant positive correlation (r=0.26) as did BVv with both BVd (r=0.65) and PMNv (r=0.41). In the capsule region at two weeks, Cv had significant negative correlations to CTH (r=-0.33), Mv (r=-0.35), BVv (r=-0.53f), and BVd (r=-0.39). Again BVd and BVv had a significant positive correlation (r=0.79). At four weeks, Mv and BVd had a significant negative correlation (r=-0.45) as well as Cv and Fv (r=-0.59). The BVv and BVd had a significant positive correlation (r=0.82). In some cases, the measured values of fiber diameter and fiber spacing were very different from the expected values. The percent open areas, however, were usually quite similar. Careful measurements of these configurational variables were essential for accurate comparisons of the experimental results. Examination of the fabrics with FTIR yielded only very small differences with respect to the band frequencies. Because PET is such a strong absorber of infrared light and because of the thin nature of the coatings, the characteristic absorbance bands of the coatings may have been easily masked. The shift in the absorbance spectra of the fabrics with coatings of groups 1 and 3 is probably correlated to the coating chemistry. This shift from 3430 cm-1 to 3434 cm-1 may be due to carbonyl absorbance and stretching of –OH groups. The absence of this shift in the spectra of fabrics with coatings of group 2 is a sign that these fabrics may have either no coatings or coatings of chemistry easily masked by the PET. The similarity in the spectra of fabric groups 1 and 3 and the fact that all of the coatings are derived from the same original polymer, reinforce the validity of the method of comparisons between groups. Trends seen with all nine fabrics were compared to those trends seen with just the six of groups 1 and 3. The similar trends found reinforced the idea that these coatings are not substantially different as well as the belief that configuration is more important than chemistry for stable coatings in this size range. The only residue found after Soxhlet extraction was found in the extracts of the fabrics using acetone. Since the residue was found when acetone was used without any fabric, the substance may have come from the container used to transport the fluid. Therefore, there did not appear to be any substances leaching from the fabric materials, the coatings were stable, and no toxic effects due to leaching would be expected. The severe response seen with a few of the implants that were not used in the analysis was probably related to the surgical procedure. Since this, only occurred in some of the implants on some of the animals it is probably not related to the implants. It is most likely that although only blunt dissection was used, inadequate hemostasis could have occurred. Pore areas: In the pore area, it was seen that larger fiber diameters resulted in fewer macrophages. This was seen with both the nine implants and the six similarly coated configurations. This drop off occurred between the 67 and 72 μm fiber diameters at both two and four weeks. The response surface regressions also showed this trend, at two weeks, but also that volume percent decreased with increased fiber spacing for both the six and nine fabrics. Fiber diameter was noted to be important to both models while fiber spacing was important only for the model based on the coated fabrics. Others have seen this effect, that if the object or surface roughness is larger than the size of a macrophage (50 μm) it is seen as a large smooth surface by the macrophages [7,18,23,24]. Also fiber spacing should only be important, if the macrophage/GC response reduces the effective pore diameter below 40 μm, which was not the case for any of the samples used. In addition, the lack of change in response over time suggests that the chronic inflammatory process, although dynamic, is relatively stable by 2 weeks. Although there were some significant differences in the Fv, the values were near 22% for all fabrics at both time periods. The only correlations found were between Fv and Cv. Although other investigators have found a direct relationship between fibroblast population and fiber diameter [12,13], this was not seen in this case. The fibroblasts appear to be evenly distributed in the available space independent of fiber size or spacing. In addition, no significant difference was seen with regard to time, which again implies a steady-state response is reached by two weeks. Values of BVv were typically very small at both two and four weeks. Although some differences were noted, no significant differences were found between fabric configurations. The high coefficient of variation (0.90 at two weeks) for this measurement was at least partially responsible for this. Small measurements with respect to density, such as for the BVv, have a large inherent variability when measurements are made using stereological techniques. There is also the possibility that some of the blood vessels could not be identified because they collapsed or were too small to be easily detected. Estridge et al., however, examined several methods of quantifying blood vessels and found stereological methods to be the best way to make this measure for dorsal skin wound healing . Since the area of the fibers was subtracted out for the volume percent measure, the number is more representative of blood vessel density versus angiogenic response. The high standard deviation (70-170% of the mean) contributed to the lack of statistically significant differences among samples. For example, with the standard deviation at 125% of the mean there needs to be a 15 fold increase to be detectable. In this case, there was only a 13-fold increase between the highest and lowest values. To detect the differences seen either better methods are needed to reduce the variability or a larger sample size would be required. When examining the total perfusion (blood vessel volume fraction without subtracting off the fibers) the differences between the highest and lowest values increased with the most notable relative increases for two of the samples with the highest open area (124 μm spacing/50 μm diameter and 201 μm spacing/105 μm diameter). Although blood vessel volume percent did not appear to change with configuration, the blood vessel average diameter did. The surface response designs predicted larger vessel diameters in regions of both small fiber spacings and diameters and large fiber spacings and diameters. The models showed there was a more significant effect due to the fiber spacing than the fiber diameter. Large vessel diameters found in fabrics with large fiber spacings and diameters is logical since there is more space for the vessels to grow. The large fiber diameters also probably increase the effective pore area by decreasing the macrophage response; which has been seen by others [6,12,13]. The interesting result that larger vessels were found in fabrics of small fiber spacings and diameters only occurred at two weeks. This effect could therefore be a result of the early chronic inflammatory response with these fabrics. The Cv, as with the fibroblast response, did not vary significantly with configuration; staying close to 55%. The differences (although not statistically different), which were seen at two and four weeks, demonstrated larger percents of collagen in fabrics with larger fiber diameters. This could similarly be a result of the decreased macrophage response providing more room for collagen production and maturation. Again the lack of differences seen with time, suggests a steady-state reached by at least week two. Few significant differences were found with the PMN response with respect to fabric configurations at two and four weeks. Although there was a statistically significant increase between two and four weeks, the range was only from 0 to 2.3 volume percent; not significantly greater than that found in normal rabbit skin . The giant cell responses yielded significant regressions at two and four weeks with nine fabrics but not with just six. At two weeks the model paralleled that of the macrophage response: the fraction of fibers surrounded by giant cells decreased with increasing fiber diameter. The four-week model, similarly showed a smaller response with larger fiber diameters. It, however, was able to predict a minimum value at a fiber spacing of 123 μm and a fiber diameter of 108 μm. This prediction is hard to explain relative to the other results. It however was greatly influenced by one fabric (158/48) with a 162 μm fiber spacing and 72 μm fiber diameter, having a significantly higher value (2 fold) than the others but an n value of only 2. In addition, a time difference in the giant cell response was seen for only one fabric (88/34), again a sign of a relatively steady-state chronic inflammation. Capsules: In the capsule area, the macrophage response varied little at two weeks. At four weeks, however, a highly significant regression was found for the four fabrics in coating groups 1 and 3. This model predicts a decreasing Mv with increasing fiber spacing and fiber diameter. This effect is probably similar to the one for the pore area since most of the macrophages must travel through the capsule first. Again there were very few differences seen with respect to time, implying a relatively steady-state response reached at two weeks. The Fv, Cv, PMNv, and BVv did not have any trends or significant regressions. Only a few fabrics displayed a difference over time implying a relatively steady-state response, had been reached by two weeks. As in the pore region, configuration did appear to be a factor affecting vessel diameter. A regression, similar to the pore data, for BVd was found using all nine fabrics. As expected, large vessels in the pores would have to pass thorough the capsule. The lack of any significant differences or regressions at four weeks suggests configuration had a decreasing influence with time. Although other investigators have found that increased scarring is typically seen around implants with larger porosities [12,13,28,29], in this case, capsule thickness was not as clearly related to configuration. There were some indications that it increased with increasing fiber diameter, but was not statistically significant. Overall, although effects due to fiber spacing and fiber diameter were expected to be interactive, little evidence for this was found. There was some indication of a combined effect on the giant cell response and the blood vessel size, but this was not significant and could be explained by the macrophage response. The range of fiber spacings tested (88-200 μm) with a 20-50% porosity probably reduced the influence of fiber spacing. At these fiber spacings and porosities, the reduction in effective pore area caused by increased inflammation probably has less of an effect than if the fiber spacings were closer to 40 μm. In this study, even though the two smallest fiber diameters had some of the smallest fiber spacings, they were still over 88 μm. The Fv and Cv appeared to be affected only by how much area was present for ingrowth. The slight increases in collagenous ingrowth seen in fabrics with larger fiber diameters can be explained by the decrease in macrophage and giant cell response, since the collagen response did exhibit significant negative correlations with both the macrophage and giant cell response. The trends for the nine fabrics were similar to those when only the six coated fabrics were used. Therefore, in this case the configuration seems more important than chemistry or the surface chemistry was really not different enough to matter. Also the stability of the coatings, in this study, should have reduced the influence of chemistry relative to configuration for the fabrics tested. It would be expected that if fewer samples are used, the regression determined may not be as representative of the responses. This was a problem particularly at four weeks, where only four fabrics were tested which had coatings of groups 1 or 3. This probably explains the shortage of significant regressions found at four weeks with this group of fabrics. The use of histomorphometric techniques to quantify the tissue response helped eliminate some of the subjectivity associated with this analysis when grading scales are used as well as allowed the use of parametric statistics for comparative purposes. Some additional, alternative methods may be necessary to adequately describe the blood vessel response, such as endothelial cell staining, because of the difficulty in its accurate and precise quantification. Although determination of some correlation between percent open area and tissue response was attempted using the RSREG and GLM procedures, none could be found. It is possible that percent open area simply had an availability type of effect. Larger percent open areas, at this fiber spacing, may simply allow more ingrowth per unit fabric area, but not affect the type of ingrowth seen. The animal model is always a source of variability in results when comparing studies. Sauvage et al. stated that for optimal healing, the porosity and other physical characteristics of a vascular graft may be species specific being dependent on vascular healing mechanisms and fibrin stability . Van Mullin et al. in 1990, however, found similar results in humans and animals with a subcutaneous implant . The exact relationships will need to be found in order to fully realize the significance and clinical predictability of the results of studies such as this one. Most of the surface response regressions determined here did not exhibit any maxima or minima. Because no optimal values could be found, a clear, single optimal configuration really cannot be determined from these data. There was a tendency for a decrease in the amount of chronic inflammatory response and increase in blood vessel size in regions of larger fiber spacings and diameters. Further information would need to be gathered in a larger range to determine if these trends peak or level off. If the macrophage response is significant, the giant cell response will most likely increase and the fibroblast and collagen responses should decrease. Significant correlations were found when comparing the macrophage response with the giant cell and collagen responses, being positive and negative, respectively. Accordingly, larger fiber spacings and fiber diameters will result in a reduced inflammatory response and an increased fibrous response. It has been postulated that some stimulation by macrophages will enhance blood vessel infiltration and growth. The ideal fabric configuration, in this study, then, may lie in an area of intermediate fiber diameters to maintain some macrophage response and large fiber spacings to enhance collagen production and maturation and vascular ingrowth. The exact configuration will depend on the application. It is possible to control, to some degree, the tissue response to an implant by manipulation of the implant’s configuration. The trends shown here will be useful in determining alterations, which may be made in material configuration to optimize the tissue response for a specific application. Further testing, however, with more different configurations particularly in the 40-80 μm range would be helpful to determine these optimal ranges. In addition, longer time periods should be examined to assure that this response does reach a steady state by two weeks. It will also be important to compare these in vivo results to similar fabrics used clinically to determine how predictive this type of study is of clinical outcome. Using this information, studies could be conducted on the effect of these parameters on tissue response in the case of a threedimensional structure. More consideration could then be given to the effect of configuration on the speed of ingrowth into the depth of the implant. The vascular response will play an even more crucial role in these three-dimensional structures since vessels in the capsule surrounding the implant cannot provide the nutrients to the cells deep within it. Another important aspect that became an issue in this study was the relative importance of configuration versus chemistry. Although it is believed that in the range used in this study with stable surfaces, configuration is controlling more than chemistry, this needs to be established; with a wider range of surfaces and materials with similar configurations. Porous filter fabrics composed of varying combinations of fiber spacing and fiber diameter were implanted in the subcutaneous tissue of rabbits to investigate the effect of configuration on tissue response. Regressions were determined for various tissue response parameters where possible. These resultant trends could be used to direct further investigation into the effect of three-dimensional configurations on response and, eventually to guide manipulation of currently used porous materials to improve performance. Although all the relationships desired could not be determined due to high variability and that the fiber diameters were actually higher than the values supplied by the manufacturer, some important relationships were established. First the transition between high and low macrophage/giant cell response occurred between 67 and 72 μm vs. the 50 μm predicted. The decrease in effective pore area below this transition did not, however, have as great an impact as anticipated (although a decrease in blood vessel diameter was seen) possibly due to the fact that the smallest fiber spacings had fiber diameters above the transition (all but one) vs. all having fiber diameters below the transition (based on manufacturer’s data). Also if the highest macrophage/ giant cell response removes 40 μm (20 μm/per fiber) the effective pore area would still be above 40 μm for the two fabrics with fiber diameters below the transition (48 μm and 80 μm). The fact that the BVv variability was so high also made comparisons and regressions difficult. Possibly another variable like average distance between vessels would have had less variability. It would have then been possible to show that an 80 μm spacing acted like a 40 μm spacing with fibers below the transition. This variability still leaves open the actual clinical impact of fiber diameters below the transition size. Still the responses were mostly controlled by the macrophage/ giant cell response, which was mostly controlled by the fiber diameter; with fiber spacing and % open area not having much of a statistically significant effect. The work still implies that meshes with fiber diameters below the transition level elicit a more severe macrophage/giant cell response (essentially a more severe chronic inflammatory response) that would require the optimal fiber spacing to be increased compared to meshes with fiber diameters above the transition. In addition, the increased inflammatory response increases the chances of tissue breakdown, as seen in meshes used to support the uterus and have eroded through the vaginal wall . Although most current hernia meshes have fiber diameters above the threshold (some are right at the threshold), this has been a bigger issue in the past [15,18]. However chronic inflammation is still a problem in many of the failed meshes; leading to tissue erosion or inadequate incorporation (and insufficient support) . Therefore although failure of these fiber mesh devices can occur due to strength issues unrelated to fiber diameter or spacing, in many cases these two parameters are the main causative factors. Failures related to the chronic inflammatory response (e.g. tissue erosion and inadequate strength) are more likely as the fiber diameter goes below 67 μm. Below this fiber diameter threshold, the fiber spacing to allow adequate tissue ingrowth would need to be increased to account for the reduction in effective pore diameter. This work was supported by the CDC (through the UAB Injury Control and Research Center). Yannas IV, Burke JF, Gordon PL, et al. Design of an artificial skin. II. Control of chemical composition. J Biomed Mater Res. 1981;14:107-31. Yannas IV, Lee E, Orgill DP, et al. Synthesis and characterization of a model extracellular matrix that induces partial regeneration of adult mammalian skin. Proc Natl Acad Sci. 1989;86:933-7. Greisler H, Kim D. Aspects of biodegradable vascular prosthesis. ASTM; 197-218. Annis D, Burnat A, Edwards R, et al. An elastomeric vascular prosthesis. Trans Am Soc Artif Intern Organs. 1978;24:209-14. Mooney D, Langer S. Engineering Biomaterials for Tissue Engineering: the 10-100 Micron Size Scale. . The Biomedical Engineering Handbook. 1995;1609-1617. Feldman D, Hultman S, Colaizzo R, et al. Electron microscopic investigation of soft tissue ingrowth into dacron velour with dogs. Biomaterials. 1983;4:105-11. Feldman D, Barker T, Bowman J, et al. Biomaterial enhanced regeneration for skin wounds. Biomaterials and Bioengineering Handbook. 2000:807-42. Shanbhag A, Jacobs J, Black J, et al. Macrophage/particle interaction: effect of size, composition and surface area. J Biomed Mater Res. 1994;28:81-90. Gonzalez O, Smith R, Goodman S. Effect of size, concentration, surface area, and volume of polymethylmethacrylate particles on human macrophages in vitro. J Biomed Mater Res. 1996;30:463-73. Kossovsky N, Heggers J, Parsons R, et al. Analysis of the surface morphology of recovered silicone mammary prostheses. Plast Reconstruct Surg. 1983;71: 795-802. Mikos A, Sarakinos G, Lyman L. Laminated three-dimensional biodegradable foams for use in tissue engineering. Biomaterials. 1993;14:323. Sanders J, Bale S, Neumann T. Tissue response to micro-fibers of difference polymers: polyester, polyethylene, polylactic acid, and polyurethane. J Biomed Mater Res. 2002;62:222-7. Sanders J, Stiles C, Hayes D. Tissue response to single polymer fibers of varying diameters: evaluation of fibrous encapsulation and macrophage density. J Biomed Mat Res. 2000;52:231-237. Bernatchez S, Parks P, Gibbons D. Interaction of macrophages with fibrous materials in vitro. Biomaterials 1996;17:2077-86. Brown CN, Finch JG. Which Mesh for Hernia Repair? Ann R Coll Surg Engl. 2010; 92: 272–8. Klinge U, Klosterhalfen B, Birkenhauer V, et al. Impact of polymer pore size on the interface scar formation in a rat model. J Surg Res. 2002;103:208–14. Anthony T, Bergen PC, Kim LT, et al. Factors affecting recurrence following incisional herniorrhaphy. World J Surg. 2000;24:95–100. Kilpadi D, Feldman D. Biocompatibility of silicone gel breast Implants. Biomaterials Engineering and Devices: Human ApplicationsHumana Press. 2000;1: 57-84. Klosterhalfen B, Junge K, Klinge U. The lightweight and large porous mesh concept for hernia repair. Expert Rev Med Devices. 2005;2:103–17. Klosterhalfen B, Hermanns B, Rosch R. Biological response to mesh. Eur Surg. 2003;35:16–20. Schumpelick V, Nylus L. Meshes: benefits and risks. Berlin: Springer; 2003. Zieren J, Neuss H, Paul M, et al. Introduction of polyethylene terephthalate mesh (KoSa hochfest) for abdominal hernia repair: an animal experimental study. Biom Mat Eng. 2004;2:127–32. Nagse M. Host reactions to particulate biomaterials. In: Wise D, editor. Encyclopedic Handbook of Biomaterials and Bioengineering. 1995;269-303. Black J. Biological Performance of Materials: Fundamentals of Biocompatibility. 1992;92. Feldman D, Czuwala P, Kelpke S, et al. A biocompatibility hierarchy: justification for biomaterial enhanced regeneration, Encyclopedic Handbook of Biomaterials and Bioengineering. 1995;223-68. Von Recum A, Park J. Permanent percutaneous devices. In: CRC Crit Rev Biomed Eng. CRC Press; 1981. Estridge T, Feldman D. A comparison of three techniques to quantify vascular ingrowth into dacron velour. J Investigat Surg. 1988;1:309-19. Braunwald N, Reis R, Pierce G. Relation of pore size to tissue ingrowth in prosthetic heart valves: an experimental study. Surgery. 1965;57:741-8. Campbell C, Goldfarb D, Roe R. A small arterial substitute: Expanded microporous polytetrafluoroethylene: patency versus porosity. Ann Surg. 1975;182:38. Sauvage L, Berger K, Wood S, et al. A very thin, porous, knitted arterial prosthesis: Experimental data and early clinical assessment. Surgery. 1969;65:78-88. Van Mullin P, Vaandrager J, Nicolai J, et al. Implantation of porous acrylic cement in soft tissues: an animal and human biopsy histological study. Biomaterials. 1990;11:299-304.